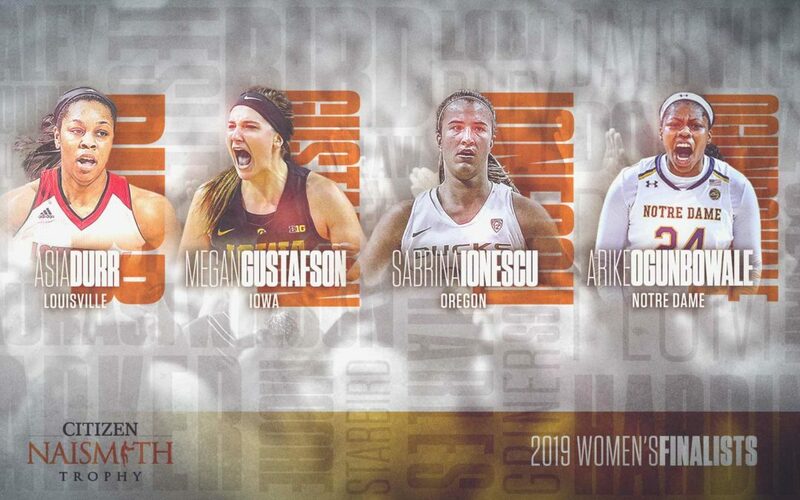 ATLANTA (March 22, 2019) – Ahead of the NCAA Tournament tip off, the Atlanta Tipoff Club has announced the four finalists competing for the 2019 Citizen Naismith Trophy, recognizing the most outstanding women’s college basketball player. The finalists for the Women’s Player of the Year include Asia Durr (Louisville), Megan Gustafson (Iowa), Sabrina Ionescu (Oregon) and Arike Ogunbowale (Notre Dame). Named ACC Player of the Year for the second year in a row, Durr led the Cardinals to a share of their first regular-season ACC championship and a 29-3 record. The senior guard led the league in scoring, averaging 21.3 ppg and 3.5 rpg. With an 82.6 free throw percentage, she also came in fifth in 3-pointers (34.7). Durr’s team tips off today in the NCAA Tournament as the No. 1 seed in the Albany Region. Gustafson led Division I in scoring and field goal percentage the last two seasons, averaging 28.0 ppg with a 69.6 field goal percentage. The senior center-forward is Iowa’s career leader in scoring (2,700) and rebounding (1,403) and will finish in the top five in blocked shots (228). In the Big Ten Championship, she scored 45 points to give the Hawkeyes their first league tournament title since 2001. With a 26-6 record, Gustafson’s team is set to play in the NCAA Tournament today as the No. 2 seed in the Greensboro Region. Ionescu was named Pacific-12 Conference (Pac-12) Player of the Year for a second consecutive season. Having led the Ducks to a 29-4 record and a Pac-12 regular-season title, she is third in the country in assists, averaging 8.1 apg, 19.6 ppg and 7.5 rpg. The junior guard produced seven triple-doubles this season, totaling 17 in her career and setting an NCAA record for both women’s and men’s players. Ionescu’s team will play today as the No. 2 seed in the Portland Region of the NCAA Tournament. This season, Ogunbowale became the Fighting Irish’s all-time leading scorer (2,471). The junior guard had a 44.6 field goal percentage, averaging 21.0 ppg and 4.9 rpg. She led the Irish to its sixth ACC regular-season title and fifth ACC Tournament championship and played a role in the team’s 2018 NCAA Championship win. Heading into the NCAA Tournament with a 30-3 record, Ogunbowale’s team is seeded No. 1 in the Chicago Region.